While thousands of viewers watched Joe Hockey’s approachable persona each week on Channel 7’s Sunrise, there is a lot more to the Australian Treasurer than meets the eye. 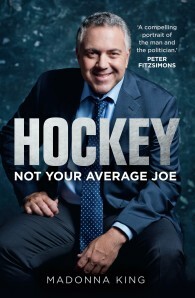 After embarking on his political career as a student, Hockey worked tirelessly to rise through the ranks of the Liberal Party – learning some pivotal lessons along the way and earning himself one of the nation’s toughest jobs. Having held a raft of senior ministerial positions in the Howard government, he presides over some of the most controversial financial decisions of the decade: rejecting the bid by US food processing giant Archer Daniels Midland to take over Graincorp; Holden’s decision to leave Australia; and demands for help from national icons such as Qantas and SPC Ardmona. Already a household name, it is hard not to know about Hockey the politician, who has declared a ‘new age of opportunity’ and whose Budget has got the nation talking. But what about the man behind the politician? Drawing on hundreds of interviews, as well as full access to Joe Hockey, his family and friends, Madonna King’s biography explores the influences that have shaped his life, and provides an exclusive and unparalleled insight into the man who will play a pivotal role in our nation’s future. Madonna King is an award-winning journalist, commentator and author. She has spent 25 years working as a journalist in Brisbane, Sydney, the Canberra press gallery and the United States. Her previous titles include Catalyst, which looks at the media, politics and the law; One-Way Ticket (co-authored with Cindy Wockner), an investigation into the lives of the Bali 9; and A Generous Helping (co-authored with Alison Alexander), which drew on the community to create a bestselling recipe collection to raise money for victims of the 2011 Queensland floods. Madonna also writes a weekly column for The Courier-Mail, sits on three not-for-profit boards, and travels Australia facilitating and moderating events. She is married to David, and they have two daughters.